The ASO Workshop will be held directly following CESCG 2005! Please have a look at the programme! 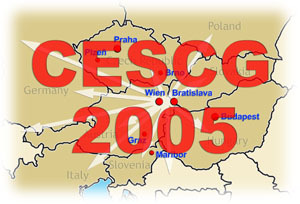 Note, that also this year, CESCG is co-organized with the Spring Conference on Computer Graphics (SCCG), which takes place right after the seminar. and is organized under the auspices of the Austrian ambassador in Slovakia Martin Bolldorf.